On the eastside of Stockton is a little gem of a hamburger joint. The staff at Flip’s Hamburgers, on the corner of Waterloo Road and Filbert Street, have been whipping up delicious burgers, hot dogs and shakes much to the neighborhood’s delight. There are more than 10 different ways to get a burger. The choices range from $3.95 to $6.50 and fries only cost $1.50 extra. 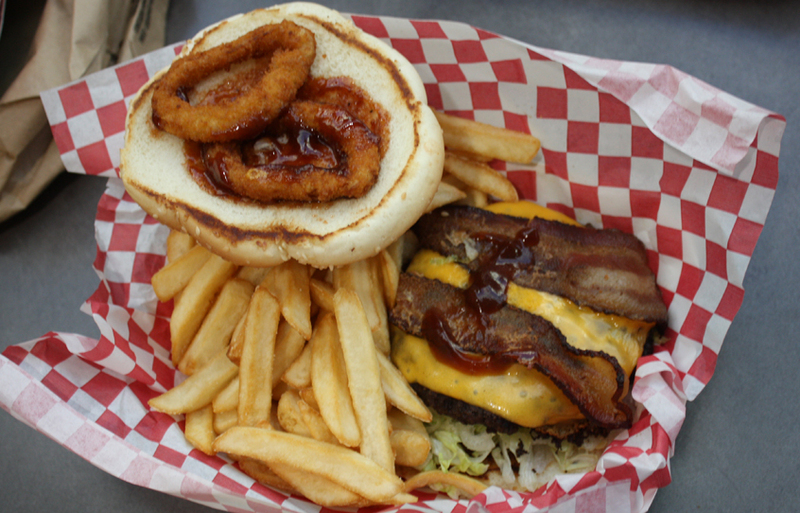 The restaurant offers classic toppings including grilled onions, bacon and barbecue sauce. Flip’s also goes out of its way to cater to everyone’s tastes by also offering fried jalapenos, fried eggs and even more for just 75-cents each topping. Fans of cheeseburgers will enjoy the Bacon Cheddar Flip, which is topped with so much cheddar it makes a halo of cheese around the burger and peeks over the bun. My lunch partners agreed the burger was awesome, very filling with a lot of cheese. The meals may not include a beverage but drinks are still affordable, with a large only costing only $1.95. The “From the Deep” menu gives locals a chance to sample deep fried Oreos, Twinkies and a personal favorite, zucchini. For those with little mouths to feed there is a children’s menu offering chicken nuggets, corn dogs and grilled cheese sandwiches. All children meals are only $3.50 and come with fries. Anyone who likes to wash down their hamburgers or fish and chip baskets with something sweet will enjoy Flip’s tasty line up of milk shakes. Flip’s offers flavors such as Rocky Road, pistachio, classic vanilla and even their special shake, Nutella with bananas. Whether you like to eat-in or take-out your food Flip’s is sure to please even those with pickier tastes. To find out more information about Flips Hamburgers they can be found on Facebook by searching “Flip’s Hamburger.” A full menu is also available on the restaurant’s website flipsburger.com. Monday-Saturday: 11 a.m. – 8 p.m.